January 15, 2014 /Comments Off on Great Giveaway from APN!!! 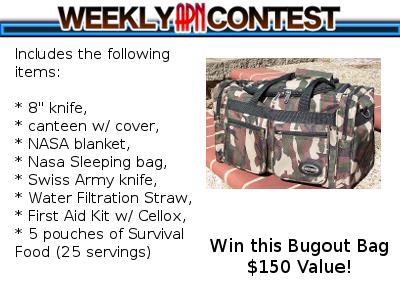 American Preppers Network (APN) has a great giveaway going on. There are only a few hours left so head on over and check it out. It’s a bug out bag from Emergency and Camping Essentials. Click here to go check it out and enter to win. You don’t have to be a prepper to make use of a bug out bag. Here in hurricane country it a must have for when you have to head to higher ground. We have had a bug out bag long before we even knew what a bug out bag was, just due to where we live. Good luck to those that enter!